Right, it’s that time of year. We have left huge excesses of consumption behind us: both in terms of material goods and of gluttony. In front of us lies atonement for our sins, where we screech on the brakes at least for a short while before normal service commences until the next festive splurge. It’s only right then, that I focus on some healthy and delicious food which is easy to knock up. I hate the word diet, and I don’t think it helps any of us. We need to change our behaviours in relation to food, and better habits take effort, discipline and time to form, as do breaking the bad ones, as for all areas of personal development. I am currently reading ‘First Bite – How we learn to eat’. It’s a fascinating discussion of the complexity around our relationship to food. The first chapter makes the point that our food likes and dislikes are much more malleable than we often think. As I find my voice in these blogs, I see that I do not always care to post recipes with exacting instructions detailing every ml of flavour to pipet into your cooking utensil. For one, its onerous, and secondly I want to stress the importance that many a recipe should exist as a framework which can go in different directions depending on what you have to hand and what takes your fancy. 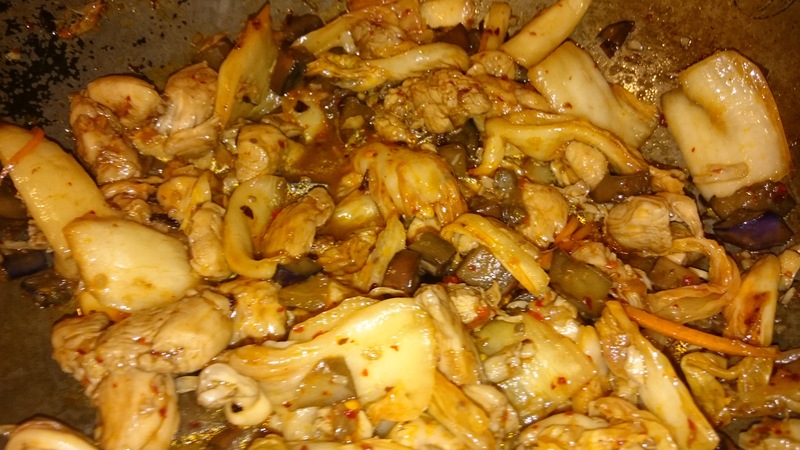 So today, I am going to talk about a very simple, healthy and quick approach to Chinese food which I learnt from the amazing and aptly titled book by Nina Simonds, called ‘China Express’. It’s an amazing book, and can’t think of another like it! Many of her dishes detail the ingredients split into 3 headings following the main ‘protein’ ingredient: Marinade, Sauce, and Minced Seasonings. This approach is a great way of thinking of a Chinese meal framework and I learnt it to cook one of my favourites, Chicken with Black Bean sauce. The general approach is to marinate your meat or vegetable protein for about an hour: consisting at minimum of around 2 tbs of soy sauce, 1.5 tbs rice wine, 1 tsp sesame oil and 1.5 tsp cornstarch (I’m being far too exacting here, a larger quantity of rice wine and soy, a bit of sesame oil and cornstarch). Prepare and cut any accompanying vegetables (e.g. red onions, peppers, snow peas). Whilst marinating prepare your minced seasonings: at minimum we are talking a few tablespoons of garlic and ginger (of course!) and some chilli flakes or fresh chilli if so inclined (and if making black bean sauce then a few tbs of chinese black beans). Yep, you guessed it: take these seasonings and go ahead and mince them! The sauce composition can vary, but I have simplified it to be about 150 ml chicken stock, a few tbs soy sauce and rice wine each, a tsp sugar and a heaped tsp of cornstarch (top tip: start with cornstarch and add a small amount of stock and stir vigorously before adding more to avoid lumps!). The prep is pretty simple, and now to cook: a process which doesn’t take long with a hot wok. Whilst making the dish you should also put on the rice to cook at the same time. Firstly, cook the marinated meat in a few tbs of oil until cooked through and seared on the outside. Keep aside, clean out the wok and add some more oil until hot and add the minced seasonings for a few seconds until fragrant. Now add the vegetables, cook through, then add the chicken back in and finally the sauce. Get the sauce to the boil and let it reduce down and get thick and glossy. The above has stood the test of time for me, this approach has allowed me to make quick, healthy and tasty meals in a very short space of time. For example, today I took this approach for Kimchi and Aubergine chicken. Kimchi, a basic staple of Korean food, is cabbage which has been fermented with chilli and garlic. Last year fermented foods became very fashionable and they are supposed to be amazing for your stomach’s health. I marinated the chicken in rice wine and dark soy sauce. I started off with some garlic and Chinese Chilli oil (in my case the amazing Lao Gan Ma or Old Lady – more about this another time!) for my minced seasonings, and my vegetables were chopped slender oriental aubergines and some kimchi. This provided a very health and delicious meal!